Hot off the press is the news that we’ve just kicked off our school rounds and are delivering tailored assemblies to schools in and around Leamington. 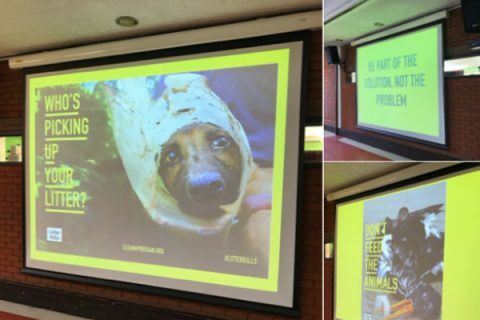 We’ve designed two different assemblies – one for primary schools and one for secondary schools – which, whilst delivering the messages in very different ways, bring focus onto the damage done by litter and throwaway plastics. We’ll let you know how they are landing in our next blog. We’ve seen plenty of research telling us that clean, smart bins are more likely to get used resulting in less litter. So last weekend, in partnership with Friends of Christchurch Gardens, we got stuck in to making some ‘binprovements’. 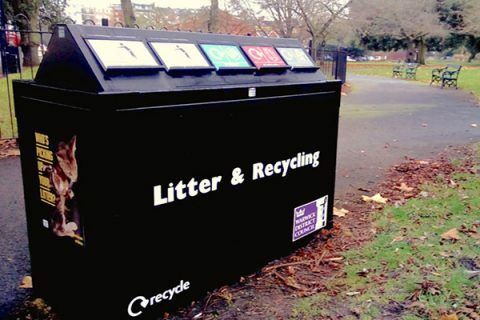 Led by our Clean Up Britain team member Ange, 5 bins in the gardens got a complete facelift, including brand new recycling stickers. We think you’ll agree that the result is great – never let it be said that the team don’t get their hands dirty! We’re planning more work like this over the coming months and are always very keen to hear from volunteers who want to join us in this kind of practical effort. Contact us if that’s you. The Christchurch Garden bins are now so much more appealing to use! 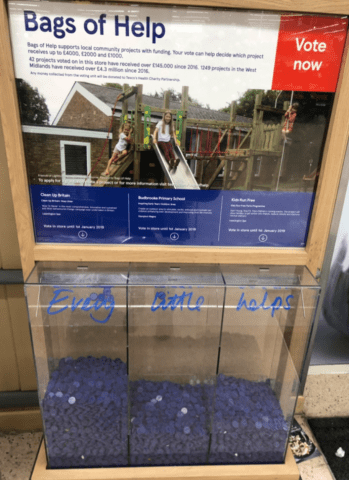 If you’ve been into Tesco Leamington recently you might have seen that our campaign is one of those in the running for a small Tesco Bags of Help grant. Voting will take place from now until Monday 31st December 2018. The project with the highest number of votes across the region will receive £4,000, the second placed project £2,000, and the third placed project £1,000. 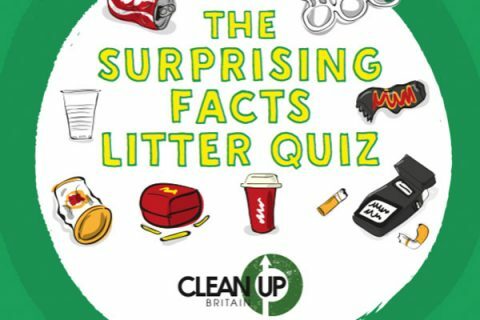 Funding is critical to ensure our campaign is a success, so when you’re next shopping in Tesco please post your tokens in the Clean Up Britain box, and ask your friends and family to do so too. Check out the photo we took this week – it’s fantastic to see how much support we have already! Post your tokens in the box on the left! Detailed planning for our Street Activist project has kicked off following a launch meeting at the Westbury Centre last month. By March next year we hope to have our ‘Street Activist Online Hub’ built which will be the go-to place for everything the community needs to make a difference to their local area – and beyond. 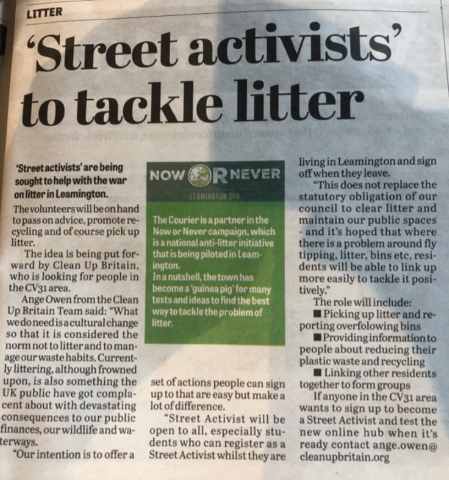 If you live in Brunswick or Lillington wards and want to get involved, drop ange.owen@cleanupbritain.org a line and we will put you on the Street Activist list. 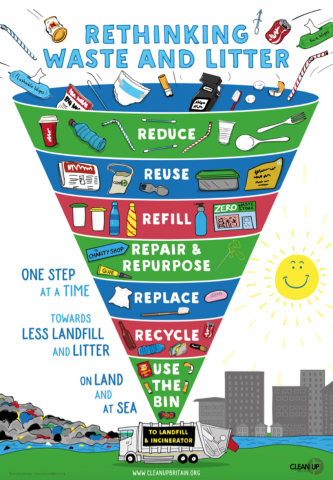 Finally for this month, as part of our work with schools in Leamington we designed a new infographic entitled ‘Rethinking Waste and Litter’. Recently shared on social media, the infographic has, on Facebook alone, reached 90,000 people, had 6000 engagements and been shared 926 times. We’ve even had requests to translate it into Russian and Indonesian! We’re providing print-ready copies to anyone who would like one. If that’s you please drop us a line at the usual place.